Steve Adler was born to a Jewish family and first lived in Washington, DC and grew up in Kensington, Maryland. His father was a World War II veteran with the U.S. Navy who later became a film editor with CBS News. His mother was a homemaker. In 1978, he graduated from Princeton University with a B.A from the Woodrow Wilson School of Public and International Affairs. He then attended the University of Texas at Austin School of Law and received his juris doctorate in 1982. After graduating from University of Texas, Adler remained in Austin to practice law. In the mid 1980s, Steve Adler co-founded the Barron, Graham & Adler LLP law firm, later Barron & Adler, LLP. He represented primarily landowners who were dealing with eminent domain and condemnation cases where the government or a private company seek to acquire their property. In addition to this practice, Adler spent most of the 1980s, his early legal career, doing civil rights employment discrimination cases. This work included representing women as well as Hispanic, African American and other minority workers in federal court, before the Equal Employment and Opportunity Commission and on matters filed with the Austin Human Rights Commission. He represented clients seeking equal treatment and opportunity in the workplace, redress from sexual harassment and denial of equal pay for equal work. Adler has argued before state appellate courts, the United States Court of Appeals for the Fifth Circuit, and the Texas Supreme Court and was named a Texas Super Lawyer from 2007-2013 and one of the Best Lawyers in America in 2007-2014. Adler has been involved in a number of community organizations in the Greater Austin region. In 2010, he joined the board of GENaustin (formerly Girls Empowerment Network), an organization that provides education and mentoring to middle school girls in local school districts to help them make good choices. From 2009-2012, Adler served as the board chair of the Anti-Defamation League Austin Region where he contributed to the creation of the Austin Hate Crimes Task Force and expanding the No Place for Hate anti-bullying program from just a few schools to over 300 schools throughout Central Texas. Steve Adler has served on the Ballet Austin board since the late 1990s and he has supported the organizations work to provide community access to arts, and the creation of new works, including collaborations with organizations in other major cities in the United States and abroad. Adler was on the founding board of directors for the Texas Tribune in 2009. He was later appointed board chair, a role he resigned from in January 2014 in order to launch his run for Austin mayor. In 1996, Steve Adler assisted El Paso Democrat Eliot Shapleigh in his run for Texas State Senate. He then served as Senator Shapleigh's chief of staff and later general counsel from 1997-2005. During Adler's time working in the Texas Senate, he primarily focused on fairness in school funding formulas, teachers' salary issues, state budget policy, environmental protection, and equity and access issues. Steve Adler began his campaign in January 2014 for Austin Mayor and ran on a platform of reforming governance at the Austin City Council. His primary issues included governance, traffic congestion, education, affordability, environment and water, and neighborhoods. Adler entered into a run-off with City Council Member Mike Martinez in November after both candidates failed to get a majority of votes. Adler won the run-off in December 16, 2014 with 67% percent of the total vote. Adler is the city's second Jewish mayor; the first was Jeffrey Friedman, who was elected in 1975. Adler is the first mayor to serve as part of the "10-1" City Council system that was approved via referendum by voters during the 2012 election and implemented after the 2014 election. Previously, the Austin City Council was composed of six at-large Council members and a mayor. The new system is composed of ten Council members representing geographic districts and the mayor. The push to move to the geographic districts was prompted by Austin's dramatic population growth as well as a recognition that the former system often resulted in an underrepresentation of Austin's minority communities, particularly its rapidly growing Latino population. For years, the city's political establishment had abided by an unwritten "gentleman's agreement" that reserved one Council seat for a Latino and one for an African American. In March 2015, Adler denounced an anonymous group's attempt to inflame discussion of gentrification in historically black neighborhoods of East Austin by placing stickers on the doors of East Side businesses that proclaimed them off-limits to non-whites. "This is an appalling and offensive display of ignorance in our city," said Adler. "Our city is a place where respect for all people is a part of our spirit and soul. We will keep it that way." Adler has been a proponent of the Office of Equity. Following a six-month search, Brion Oaks was selected September 2016 as the City's first Chief Equity Officer. In May 2017, when the Alamo Drafthouse Cinema in Austin announced that it would hold a women-only screening of the movie Wonder Woman, one man wrote Mayor Adler an angry email about allowing the event to take place, in which he urged the boycott of Austin and called women "the second rate gender". Adler's response, in which he warned the writer that his email account had been "hacked by ... an unusually hostile individual", and listed women's accomplishments, drew national attention. In 2016, Adler and the federal Department of Housing and Urban Development declared that significant progress had been made to house homeless veterans. Despite progress in the area of veterans, work remains to be done to further reduce homelessness and associated drug use. During the summer of 2016, several people were hospitalized during an outbreak of K2 overdoses around the Austin Resource Center for the Homeless. Adler won reelection in 2018, garnering 59% of the vote in a 7-way race. On April 14, 2019, Adler gave the introductory speech at Pete Buttigieg's announcement of his candidacy for president. 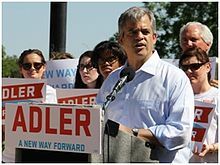 ^ "Austin mayoral candidate Steve Adler touts early fundraising lead". Austin American Statesman. Retrieved September 30, 2014. ^ a b c d e f g "What's Steve Adler Done for Austin". The Austin Bulldog. Retrieved September 24, 2014. ^ "Anti-Defamation League Jurisprudence Award" (PDF). University of Texas at Austin. Retrieved September 28, 2014. ^ a b "Steve Adler Launches Mayoral Campaign". The Austin Bulldog. Retrieved September 24, 2014. ^ Princeton Alumni Weekly (Volume 78 ed.). 1977. p. 18. Retrieved September 29, 2014. ^ a b "Steve Adler: 'New Way Forward'". Austin Chronicle. Retrieved September 24, 2014. ^ "Mr./Ms. Mayor". Austin Man Magazine. Retrieved September 29, 2014. ^ "First Time Candidate to Announce Run for Mayor". Impact News. ^ "Texas Super Lawyers". Super Lawyers. Retrieved September 24, 2014. ^ "Articles of Incorporation for the Ophelia Education Foundation". The Austin Bulldog. Retrieved September 30, 2014. ^ "Anti-Defamation League National Leadership Conference". C-SPAN. Retrieved September 30, 2014. ^ "Anti-Defamation League Austin". Anti-Defamation League Austin. ^ "2014/15 Board of Directors". Ballet Austin. Retrieved September 30, 2014. ^ "Form 990 Return of Organization Exempt from Income Tax". The Austin Bulldog. Retrieved September 30, 2014. ^ "Legislative Staff: 76th Legislature" (PDF). Texas House of Representatives. Retrieved September 29, 2014. ^ "Legislative Staff: 77th Legislature" (PDF). Texas House of Representatives. Retrieved September 30, 2014. ^ "Mayoral Candidate Questions" (PDF). Austin Environmental Democrats. Retrieved September 24, 2014. ^ "Steve Adler: 'New Way Forward'". The Austin Chronicle. Retrieved September 24, 2014. ^ "First Time Candidate to Announce Run for Mayor". Impact News. Retrieved September 24, 2014. ^ "Mike Martinez calls out Steve Adler on tax exemption proposal". KVUE. ^ "Property tax exemption proposal worth considering". Austin American Statesman. Retrieved September 24, 2014. ^ "At Austin mayoral debate, Mike Martinez and Steve Adler trade jabs". Austin American Statesman. Retrieved September 24, 2014. ^ "Mayor candidates say city of Austin should help fund pre-K programs". Austin American Statesman. Retrieved September 24, 2014. ^ Air 1:55PM (March 27, 2018). "Live Election Results for KVUE in Austin". KVUE.com. Retrieved March 21, 2019. ^ a b Goldreich, Gloria (February 14, 2016). "Austin". Hadassah Magazine. Retrieved March 21, 2019. ^ "Austin's new mayor and city council take office". KXAN. January 6, 2015. ^ Pagano, Elizabeth (February 1, 2013). "The road to 10-1". Austin Chronicle. ^ Guerra, Daniel (April 23, 2012). "Hispanic Leaders call for change to Gentleman's Agreement, just not yet". KUT. ^ O'Rourke, Ciara (March 18, 2015). "Austin Mayor Steve Adler: 'White people' stickers appalling, offensive". Austin American-Statesman. ^ "Austin mayor outraged by 'white people only' stickers posted on businesses". CNN. March 19, 2015. Retrieved March 19, 2015. ^ Comms. ""Great Cities Do Big Things" – State of Our City Feb. 16, 2016 Austin, Texas – Mayor Steve Adler". 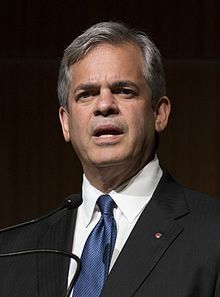 Mayoradler.com. Retrieved March 21, 2019. ^ Chen, Joyce (June 1, 2017). "Mayor Responds to Boycott of All-Female 'Wonder Woman' Screening". Rolling Stone. Retrieved November 9, 2017. ^ Romano, Nick (June 1, 2017). "Wonder Woman: Mayor defends all-female screening". Entertainment Weekly. Retrieved November 9, 2017. ^ Serena, Katie (June 2, 2017). "Austin mayor claps back at "Wonder Woman" women-only screening hater". Salon. Retrieved November 9, 2017. ^ Claire Ricke (August 19, 2016). "Austin: Plan to house all homeless veterans accomplished". Kxan.com. Retrieved March 21, 2019. ^ CBS Austin. "Officials concerned about K2 outbreak in Austin | KEYE". Keyetv.com. Retrieved March 21, 2019.